When you look at a home, what's one of the most prominent features that's also one of the most overlooked? The roof. Because of its prominence, the roof sets the tone for the rest of the style of the home. Cedar shakes complete a New England salt box. Tiles say "Spanish Colonial." Standing seam metal roofs look at home on a Low Country Cottage. Asphalt shingles are common on all styles of homes. For decades, a metal roof meant corrugated panels, which were common on sheds, barns and rural housing, or standing seam panels commonly found on commercial buildings. But today metal roofing – available in steel, aluminum and copper, primarily – can mimic wood, stone and clay to complement historic and contemporary styles. On the roof of a home, the actual material is often undetectable. So a homeowner or building professional can incorporate metal roofing without compromising on the vision for the home. While it can be hard to believe, steel and aluminum can metal roofs can mimic virtually any other type of historic or current roofing material. You get all the benefits of metal roofing while staying true to your dream. With custom coatings, metal roofs blend into historic styles such as a French Chateau or a Victorian mansion. From ground it's impossible to tell whether a roof is fragile, heavy slate, or lightweight, durable metal. Metal roofs are very popular in contemporary-style homes as well. The Proud Green Home at Serenbe is a net-zero home that features roofing as well as vertical exterior wall panels from Metal Sales. Metal roofs consist of steel, aluminum or copper panels that fit together on the roof to create durable, low- maintenance cover over the building. Metal roofs can installed over existing asphalt shingles, or designed into a new home. Steel roof panels are the most common type of metal roof. Rolls of 24- or 26-gauge steel sheets are given a metallic coating to prevent rust, followed by a baked-on paint finish. Aluminum sheets only require painting. Aluminum panels are often used in coastal areas to help ward off corrosion from the salty air. As a natural metal product, copper weathers without corroding and is not coated or painted. Copper is usually reserved for special features, such as architectural details like the roof of a prominent bay window. Coatings on steel roof products include zinc (galvanized) or a mixture of aluminum and zinc (galvalume or zincalume). Galvalume-coated panels typically offer longer service life. Manufacturers usually offer coatings in several thicknesses, and the thicker the coating, the longer the service life, and higher the cost. Stone-coated roof panels receive an acrylic coating embedded with stone granules. These offer a less metallic look to better mimic other types of roofing material. Metal roofing offers a variety of benefits that offer a very high return on investment, both in terms of dollars as well as environmental impact. Metal roofing usually contains a high percentage of recycled content, and it's usually 100 percent recyclable at the end of its useful life. Often, a metal roof can be installed over existing asphalt shingles, which saves the shingles from going to a landfill. Asphalt shingle roofs have typical lifespan of 15-20 years compared to metal roofs that carry a warranty as long as 50 years. In the lifespan of a metal roof, a shingle roof may be replaced two to three times. Cool roofs meet EPA Energy Star Roof Products Program performance criteria with a reflectivity as high as 90 percent for painted and granular coated-metal roofing. Metal cool roof materials are available in a wide spectrum of colors to complement many architectural and historic styles. Cool roofs with the Energy Star label are eligible for federal tax credits, and many metal cool roof products can earn points for LEED certification through the U.S. Green Building Council as well as other green building programs. 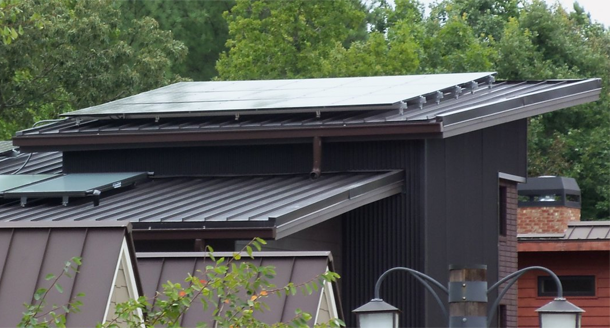 Metal roofs work well with racks for roof-mounted solar panels for photovoltaic power or thermal water heating. Because the roof is long- lasting, there's less chance of having to remove the solar racks to replace the roof. The metal panels provide convenient mounting options for various installation types. Metal roofs provide cleaner runoff for harvesting rainwater. Other types of roofing, Asphalt shingles in particular, lose materials such as sand granules over time, meaning the runoff water may need to be filtered before use. A metal roof offers long-term practical advantages for your home. It's safer in harsh weather and can help reduce energy bills. Aesthetically, a metal roof can complement many architectural styles, from a rustic farmhouse to a contemporary home to fulfill your vision for your home.